What are your new-born must haves? Rest. Every new parent wants more of it. My first child was not a sleeper, unless I put him in front of the washing machine or rocked him constantly whilst shushing like a crazed librarian. With number two imminent I have begun researching products and means that may help avoid the black hole of sleep deprivation. Those dreaded late night dances in circles, rocking soft a bundle through the sleepy darkness. It is survival of the fittest. Purchasing strong coffee and sleep aids are good investments for any new parent. Prenatally, babies are accustomed to being surrounded by noise; surprisingly the womb is not the quiet ‘Zen-like Spa-esk’ abode that you may think. White noise offers a familiar sound, a sense of security. This can help create a calming sleep environment and may block out other stimulation and sounds that may distract them such as siblings pretending to be Batman, etc. It works wonders to soothe fussy babies, but can also help toddlers, children and adults. Some have raised apprehension in that sleep aids may cause hearing damage. This is why I favour preset toys such as MyHummy over white noise machines as you cannot accidently put the decibel volume too loud. But won’t they become reliant on the product? Instead of dependence a MyHummy offers more a comforting association. Similar to a soothing bath-feed routine, is can be a positive cue and does not have to be used for every single nap. It’s not like your child at 38 will be snoozing with their bear. MyHummy has a BIG fan base among parents and I always favour buying products with a plethora of positive reviews. Nothing has 100% certainty of working. Products may help settle your child faster and sleep for longer but remember if you want a magic solution, to have 12 hours sleep a night the only option is to put your offspring on Ebay. Not all babies will respond well to white noise. Newborns are not like cupboards, all are different; have their own personalities, likes, dislikes and their own sleep needs. 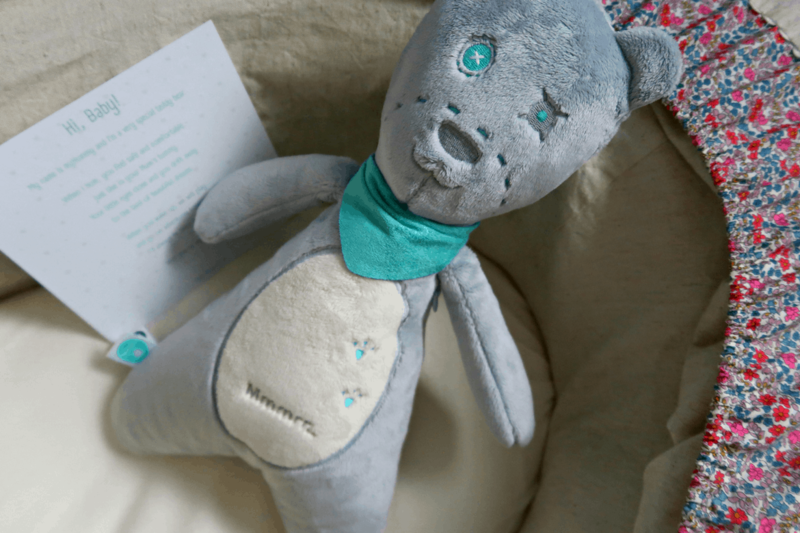 Carefully created with children and parents in mind, MyHummy have designed unique white noise sleep aid toys ranging from traditional teddy bears to novelty, ball-shaped soft toys and attachable Sleepy Heads. An award winning product suitable from birth with an age recommendation of 0-3 years, they comply with the strictest EU safety standards and are made of certified materials that can be hugged, squeezed and sucked on. How is it different from other white noise options? Ash emits a variety of low frequency noises: a hair dryer, vacuum cleaner, ocean waves, falling rain and amniotic fluid with heartbeat. Heartbeat settings are comforting for new-born’s as they mimic the mothers. I like that it offers volume control and after an hour automatically, gently, fades out as to not wake the child. I have started to put MyHummy on bump so he/she can become familiar with the sounds in utero. Thanks to the smart Sleep Sensor, it resumes humming if the baby starts to stir or if there is an increase in the background noise. MyHummy can also be used in non-stop mode for up to 12 hours. There has been some commentary at the quality of sounds being low but there is a definite definition between all and remember white noise is not going to sound like an exact recording of a sound. It does seem quite loud at first but once nestled in Ash this does make a difference. The only downside I felt is that the battery component needs to be removed with a small screwdriver which I didn’t have but safety over convince is much more important! Instructions are clear and we found Ash really easy to use. As it is a high usage product you will want to use a good quality brand of batteries as when they are running low some features do not work. Similarly with any child’s toy etc the power can be drained with constant handling but I find this easily remedied by investing in rechargeable batteries. Our MyHummy arrived beautifully wrapped, accompanied by instructions and the separate electronic component. The packaging is of a really good quality as you would expect. Ash’s design is adorable and I was impressed by how big he was. I like that as well as a sleep aid the Teddy MyHummy’s can be played with in the day. The fabric is soft with no plastic parts that could cause injury or concern and best of all is machine washable, a must for longevity being around infants. So why buy a MyHummy instead of using a different sleep aid product? Apps on mobile phones may be cheaper but they risk over heating near an infant, parents have to sneak in and out and unexpected calls will wake babies rather than help then sleep. Whilst some have commented that the MyHummy is an expensive buy if you look at similar market items they are all in a comparable pricing range. Also there is a range of items on offer dependent on budget; the ‘Sleepy Head’ that retails at £39.99, then the ‘Snoozy’ at £49.99 and then the premium range ‘Teddy Bears’ at £59.99. SO, which white noise toy to choose? The market is full of options. Of the four ‘top’ options, (inclusive of MyHummy!) Ewan The Dream Sheep has high ratings on Amazon however a huge con is that you cannot wash the toy, it does not respond to babies cries and only lasts on a twenty minute timer. Whisbear has magnetic legs and can be attached to car seat etc, however it only has one sound which does limit the product hugely if the infant does not like that particular noise. The Slumber Buddy offers a range of different designs though needs to be placed separate from an infant, this offers a light display as well as sounds though these are described as overly loud even on the lowest setting. Feedback is positive in regards to babies that respond to light, though my son was always overstimulated. Overall we are so impressed with MyHummy and would happily recommend the product and favour it above the other options. Have you used a white noise sleep aid with your baby? Did it work as well as they say it does? Which type of MyHummy would you prefer? Note: We were kindly gifted a MyHummy for the purpose of this review but all opinions are our own.